From Goodreads ~ A practical, accessible guide to the ingenious and creative things that can be done with a digital compact or camera phone. 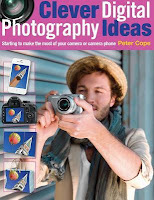 "Clever Digital Photography Ideas: Starting to make the most of your camera or camera phone" is a chapter from the book "100 Clever Digital Photography Ideas" and provides a variety of simple ideas for getting even more from your camera or camera phone than just a record of those memorable moments. Open your eyes to the creative possibilities with your digital photo technology, from using a basic compact camera to the latest smart phone. Whether a novice or a pro, "Clever Digital Photography Ideas: Starting to make the most of your camera or camera phone" will show you how to break out of your comfort zone and try something exciting and new. Clever ways to get started - comparison of cameras, different parts of a camera, improving your auction site pictures, etc. Clever ways to keep records - creating a visual inventory of your home, recording a car crash, copying with your camera (ie important documents), etc. Clever ways to tackle problems - determining if you remote control is working, seeing around corners, etc. Clever ways to carry out surveillance - what's going on in your backyard, burglars, etc. Clever ways to boost your memory - creating a manual when you take things apart, remembering a number, etc. Clever ways to shoot hobbies and interests - coins, stamps, children and pets, theatre, sporting events, etc. Clever ways to improve colour rendition - white balance, etc. This book doesn't tell you how to take pictures (ie shutter speed, aperture, etc.) ... it's about giving you ideas to try something new and different. I always enjoy books like these - they do help to inspire. Sometimes I'm stuck in a rut, photographing the same things over and over again.